I’m a master of excess, at squeezing in one more thing. I buy too many things, but if I rearrange enough times, and get smart about alphabetizing or nesting or arranging by size—or if I buy just the right containers—I can get one more thing neatly put away. I’ve found ingenious ways to use hangers and boxes and drawers for more than they’re meant to be used for. I’ve worked and reworked my bookshelves to hold one more book… and another couple or three… and this one and, oh, that one too… and finally started reading on an iPad because there just wasn’t physical room in my house for more novels, and I could get a whole lot more books in such a compact little digital space. I do the same thing with my time. There’s always room to squeeze in one more thing… a 15-minute gap here, or down time while the spaghetti is cooking, or a few minutes less of sleep. I can write cards or finish my Bible study or assemble a craft while watching TV. Read books while eating breakfast. Upload daily social media posts for a whole month in one afternoon while I watch a movie with my husband. Condition my hair while I shave my legs. Answer emails from the bathroom. Clean out the fridge while the bagel is toasting, and load the dishwasher while my lunch is cooking in the microwave. (And then reload it to squeeze in four more cups I found scattered around the living room after I thought I was finished.) You know the drill. You do it, too. Our lives aren’t meant to be so full. And yet, well, summer happens and it often brings even more to do. Given all the craziness, what would you say if I told you that you also needed to find time to pray? It’s true, though. Prayer is the way our souls find peace. It is the one place we can find rest. We can take it with us. We can lean on it and allow it to help us stand strong and firm. We can let prayer soothe our anxieties, declutter our minds, and keep us focused on the big picture—keeping our eyes on Christ. Even if you can’t find the time you think you need to pray. Prayer doesn’t have to be complicated or involved or time-consuming. Think of it as a radio playing in the background. If you can keep the lines of communication open, you will discover that you feel calmer, you remain more centered, and life feels a little less crazy. 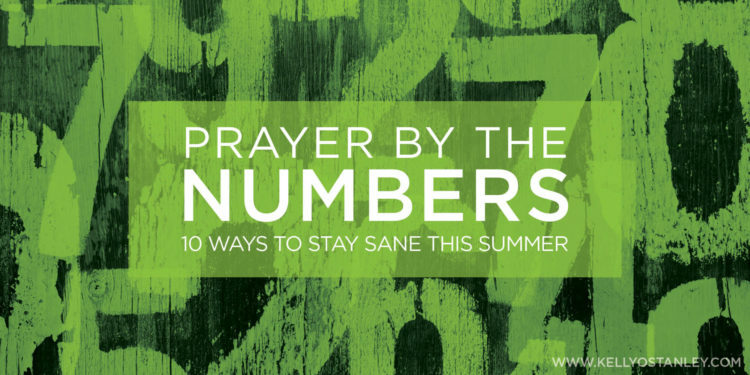 Here are some tips to help you squeeze in a little more prayer time this summer (or anytime). Let yourself off the hook. Give yourself grace—permission to be less than perfect and permission not to dwell on your failings. This may not help you find additional time, but it will allow you to use whatever time you have more productively. There’s nothing to be gained by beating yourself up—especially if it takes up time you could spend actually praying. Don’t bite off more than you can chew. Maybe now is not the time to start a new reading plan or add two new prayer groups. Don’t give up the things that keep your faith strong, but consider temporarily lowering your goals—or changing them, adapting to your new schedule. Instead of quiet time every morning, shoot for three times a week, or have it after you drop the kids off at swimming lessons. Find ways to incorporate your kids. Do you enjoy working on your Bible study over a cup of coffee one morning a week? Make a study date of it—have them grab their summer reading and sip on a flavored lemonade or fruity tea alongside you. Or sit at a picnic table with your Bible or journal while they play at the park. Make a set of keychain prayers. Cut up some index cards (or buy a set of pre-made craft tags) and put them on a keychain. When you find yourself waiting in a pickup line, or killing time in between activities in the car, flip through the names written on the tags and offer up silent prayers. Try an app like First 5, which helps you start the day with a short devotion and Bible reading before you get out of bed. Whenever you have to wait, don’t waste the time—pray. Whether you’re in the checkout line at the grocery, waiting for a train to clear the tracks in front of you, or sitting on the sidelines waiting for a baseball game to begin, offer up a short prayer. Thank God for the life you have, for the people you’re with, for your awareness of His presence. For the sunshine, for the beautiful day, for the purpose in your life. You can pray about anything, but the quickest (and least private) prayers may be ones of gratitude. Think in terms of prayer symbols. Does your sister love McDonald’s sweet tea? Say a prayer for her whenever you drive by (or through) a Mickey D’s. Is your son a soccer fanatic? Pray for him every time you pick up a cleat or dirty soccer sock. Assign “symbols” to the people in your life, and let those prompt you to pray whenever you see them—whether you’re on the go or watching TV. Print this free prayer prompt calendar. Put it on your fridge to remind you to pray whenever you open the door for some cool air or to grab a popsicle. Remember that God is with you, wherever you are. Whatever you’re doing. There may not be room for one more thing on your calendar, but there is always room for Him. Every morning, before you head out, invite Him along for the ride. I promise you, He will say yes. *I don’t want to be obnoxiously self-promotional, but I’m part of an amazing lineup of women in an online summit scheduled for June 5-8. If I didn’t think it was going to be wonderful, I wouldn’t have said anything :-). The Journey Summit is free if you tune in live, or you can buy an all-access pass to hear all the interviews anytime it’s convenient. Learn more here.